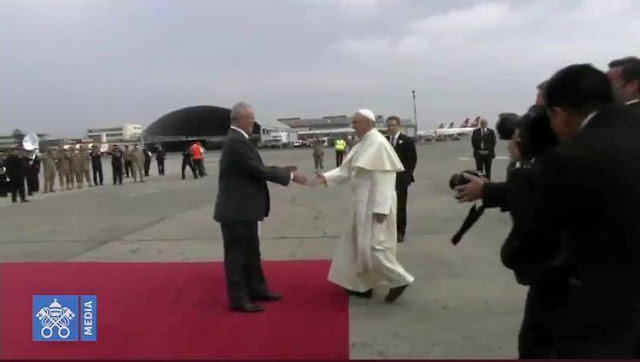 Pope Francis arrived in Peru on Thursday evening kicking off the second leg of his 22nd apostolic visit abroad. For a series of reasons the people of Peru are awaiting his words and presence with high expectation and his visit promises to be dense with activity and inspiration as he is scheduled, amongst other things, to address political leaders, celebrate Holy Mass, meet with priests and religious and pay tribute to the nation’s beloved Vergin of La Puerta. One highlight of Francis' visit will most certainly be his meeting on Friday with the indigenous peoples of Peru’s Amazon rainforest during which he is expected to issue a message of warning and of hope to the world. By Linda Bordoni Pope Francis arrived in Peru’s capital city Lima on Thursday evening beginning the second leg of an apostolic visit that is also scheduled to take him to the Amazon city of Puerto Maldonado and to the northern coastal city of Trujillo. Father Hughes reflected on the importance and on the meaning of this visit for the nation and for the world pinpointing two themes in particular: the Pope’s closeness to the marginalized and to the poor, and the fact that he will be meeting with representatives of many indigenous groups in the Amazon region highlighting his concern for the rights of indigenous peoples and for the plight of the rainforest and the need to care for “our common home”. Peru, Hughes explained, is suffering from huge problems of poverty and marginalization. It’s a multicultural multi ethnic society, there are 42 languages spoken in the country (many in the Amazon region) as well as two major indigenous languages, and many components of its society do not have access even to basic services. “I think the Pope has a particular affinity with a county like Peru, not only because he is Latin American but because he is a Latin American Pope who has been deeply involved with the whole process of reform fueled by the Conference of Medellin after Vatican 2” he said. Hughes said Francis is a very good expression and exponent of the whole reform period in the Latin American Church, having been himself an important agent in the Church in this period (Bergoglio played a major role in drawing up the Aparecida document). “He shares a particularly profound insight from the heart of the Gospel that God’s wish for people is that they are included in life and that they are not supposed to be marginalized for political, economic or cultural reasons” he said. He said his affinity with the plight of the poor gives him a strong connection to the desperateness of the current situation. “Peruvians are waiting for him for very deep spiritual reasons” he said. The second reason this visit is so significant, Hughes continues, is to do with the fact that Francis is arriving in the Amazon region and he will be meeting representatives of many indigenous groups in the town of Maldonado. “Here, Fr. Hughes said, there is a direct connection between his visit and his encyclical Laudato Sì”. Hughes described the Amazon as the place where the common home of humanity and of the world is perhaps best expressed. He said the destruction and the depredation of the Amazon is terrible and is taking place at an increasingly accelerated rate. He explained that in the town of Puerto Maldonado the great trans-oceanic highway that connects the Amazon to the Pacific coast passes through and that this is the subject of much debate because of all the scandals and corruption connected to its construction. “A major highway is always considered as progress” he said, but it must not be ignored that it also brings with it a lot of problems: “There are human, social and political consideration to be made”. Puerto Maldonado, he continued, is also a center of major drug-trafficking and human trafficking of young women for prostitution; it’s where small boys are exploited as workers in the gold mines with no consideration for their rights or their health; it’s where the major problems of the Amazon take place like deforestation and the destruction of land because of how the extractive industries operate”. He spoke of the taking of lands and livelihoods from the indigenous peoples who have been connected to this land for millennia and of how they are being used for multinational agri-business for production with no regard for the consequences this will have on biodiversity, water access and the rotation that the lands need. Hughes pointed out that the question of climate is ‘in question’ in the Amazon: “if the Amazon and the Congo, the two major river basins of the world continue to be destroyed, 20% of drinking water that is available to people in the world will be gone; 20% of the oxygen that people in the world need to breathe will be gone. These are huge levels of destruction that we don’t hear about every day and these are exactly the concerns Francis has been writing about in Laudato Sì”. So, Hughes concluded, he won’t be speaking just to the people of the Amazon but to the world, to the human family across the globe, to Christians, Catholics, believers and non-believers and he will be “drawing a line and shining a light to alert us all about the need to change, on every level; that life on earth has to be respected and that we have to become serious about the Paris Climate Treaty and about how to defend the world, its beauty, its resources and its climate from destruction”.